And a few stray thoughts for yet another Saturday. For a Saturday following the week when dark horse Pramod Sawant took over as the new chief minister of Goa. For a Saturday following the week when there was a split in the MGP which almost cost Sudin Dhavalikar his position as deputy chief minister. For a Saturday following the week when Babush Monserrate asserted that he would contest the Panjim Assembly seat which has fallen vacant after the sad demise of Manohar Parrikar. For a Saturday following the week when the Congress failed again to make good of the golden opportunity to topple the BJP government. For a Saturday following the week when Michael Lobo refused the post of speaker gifted to him. For a Saturday following the week when Narendra Modi did not wait for the cremation not out of lack of respect for Parrikar but for security reasons. For a Saturday following the week when it took petrol to get the pyre going. And a few stray thoughts on how the late chief minister’s candidate Pramod Sawant was finally sworn in as the new chief minister of Goa at a post-midnight ceremony at the Raj Bhavan. This must have been the first time a lady governor was kept awake till 2:30 am to complete the swearing in of the new Cabinet. The appointment of Pramod Sawant was not a surprise although the majority of the BJP MLAs themselves were not in favour. Even after Parrikar’s death on Sunday evening, strong demands were made to make veteran BJP leader and North Goa MP Shripad Naik, chief minister. But Manohar Parrikar had been very clear before he died that Pramod Sawant, a staunch RSS pracharak, should succeed him as chief minister. Indeed, three months ago when Nitin Gadkari attempted to persuade Parrikar to accept Sudin Dhavalikar as acting CM at least, he refused point blank. Parrikar knew of the close relationship between Sudin Dhavalikar whose daughter is married to Nitin Gadkari’s son. Parrikar was also not happy with Sudin Dhavalikar’s open association with the Sanatan Sanstha. Before Manohar Parrikar died the only person who was permitted to meet him during his last moments was Atmaram, alias Sushant Nadkarni, the additional solicitor general of the country. There is speculation that the ‘stolen’ Rafale papers which expose Narendra Modi in the Rafale deal were passed on to Sushant Nadkarni in a mini pen drive. There was an implicit threat that the Rafale scam would be exposed if Pramod Sawant was not made chief minister. It is of course possible that Sushant Nadkarni, who was very close to Parrikar, may use the Rafale papers to stake his claim for the job of attorney general, now held by 86-year-old KK Venugopal. Pramod Sawant passed the vote of confidence, which was convened as early as 11:30 am on Wednesday, quite comfortably, with all the BJP MLAs and the alliance partners voting for him. In the reduced strength of the assembly of 36, the BJP had 12 seats (minus Francis D’Souza and Manohar Parrikar, the MGP had three, the GF had three and the Independents had three, making for a total of 21). Deputy Speaker Michael Lobo presided over the assembly session since the Speaker Pramod Sawant had become the chief minister. The BJP coalition won the trust vote by the comfortable margin of five votes (20 to 15). Only the 14 Congress MLAs and NCP member Churchill Alemao opposed the election of Pramod Sawant as chief minister. Though he has been supporting the BJP all this while the NCP MLA is negotiating with the Congress for the south Goa Parliamentary seat for his daughter Valanka. Though Pramod Sawant has been elected as the chief minister he will have a tough time with two deputy chief ministers — Sudin Dhavalikar and Vijai Sardesai — and Babush Monserrate to cope with. Babush Monserrate who has been waiting patiently for the right moment, has made it clear that he will contest the Panjim Assembly seat vacated by the death of Manohar Parrikar. In the 2017 election which was held after Manohar Parrikar returned to become the CM, in a case of match fixing Babush did not contest the elections to the Panjim Assembly seats against Parrikar. The agreement was that in return Babush would be allowed to retain control of the CCP and would be appointed chairman of the Greater Panjim Planning & Development Authority (GPPDA). Originally the area covered by the GPPDA was to include not only Panjim but St Cruz, Merces, St Andre and the Kadamba plateau. Monserrate was responsible for getting Tony Fernandes and Francis Silveira elected from the St Cruz and the St Andre constituencies respectively. He also controlled the Taleigao constituencies where his wife Jennifer was the MLA. But despite his hold in St Cruz and St Andre the locals objected to extending the Panjim PDA to those areas. Similarly, Pandurang Madkaikar who was made an MLA and minister by Babush, refused to let him take over the money-spinning Kadamba plateau where a lot of high rise structures have come up. Babush was left with the original Panjim and a separate PDA for Taleigao. As in the case of the 2011 Regional Plan Babush is attempting to convert both Panjim and Taleigao into verticle high-rise concrete jungles. The floor area index has been increased to 24 sq mts in the case of residential areas and 32 in the case of commercial areas. It is also proposed to redevelop quiet serene colonies like La Campala and St Mary’s colony into high rise enclaves like Patto which will have 10 and 15 storeyed buildings. When the new Magsons building comes up at La Campala colony it will probably be 15 stories. In the case of Taleigao, even the traditional paddy fields where the harvest festival is held have not been spared, and a broad 16 metre road has been proposed to permit construction of new high rise colonies. This will be the second phase of Babush’s ambition to convert Taleigao into another Singapore, but without the supporting infrastructure. And a few stray thoughts on how Sudin Dhavalikar almost lost the post of deputy chief minister. Amit Shah insisted that Nitin Gadkari should get a letter in writing from the Dhavalikars that the MGP will not contest any of the four by-elections to be held in Shiroda, Mandrem, Mapusa and Panjim. There was of course no question of the MGP putting up candidates against the BJP for the two Lok Sabha seats in Goa. While Sudin was willing and eager to bag the deputy CM’s post, this was not acceptable to Deepak Dhavalikar who is the president of the MGP. In fact, Deepak Dhavalikar has made no secret of his intention to contest against Subhash Shirodkar for the Shiroda seat. He has been campaigning aggressively and before Parrikar’s death had been claiming that the MGP would contest all the three by-elections to the Assembly as well as the Lok Sabha. Deepak was the MLA for Priol in the earlier government, but lost the seat to Govind Gowde, minister for culture in 2017. Deepak Dhavalikar was not willing to accept the condition imposed by Amit Shah that he should give a written undertaking that they would not contest the by-elections to the Assembly and Lok Sabha seats. Even after the swearing in of Sudin Dhavalikar, Deepak is adamant on contesting from Shiroda. Sudin Dhavalikar, in fact, went away from the Bambolim Hyatt where the Cabinet was being finalized and almost missed the bus for deputy chief minister’s post. Finally he had no choice but to give in writing that his party the MGP, will not contest the by-election. This is because Nitin Gadkari persuaded two other MGP MLAs Babu Azgaonkar and Deepak Pauskar, to dessert the MGP and merge with the BJP. Under the anti-defection law if 2/3rd of a parliamentary party decides to break away it is not considered a defection but a split. With his two colleagues threatening to dessert him Dhavalikar had to eat humble pie and sign the undertaking. But Dhavalikar may not continue as the deputy chief minister as Deepak Dhavalikar is not willing to honour the promise that Sudin made to Amit Shah. Even on Wednesday after the Assembly session Deepak insisted that he would contest the Shiroda seat. The BJP or rather Chief Minister Pramod Sawant has other problems. He is facing a revolt from within the BJP itself. The original choice of at least the minority community BJP MLAs for the chief minister’s post was Michael Lobo. It was Michael Lobo who brought Vijai Sardesai to the BJP and who single-handedly hijacked the government from the Congress. But his only reward for his total loyalty to the BJP was the deputy speaker’s post. He was very disappointed that he did not get a Ministry in the new Cabinet. Even the only existing Catholic minister, Nilesh Cabral, was the last to be sworn in. It would appear that the new BJP under Pramod Sawant is no longer interested in the minority community. This is reversal of the policy of inclusion followed by Manohar Parrikar. 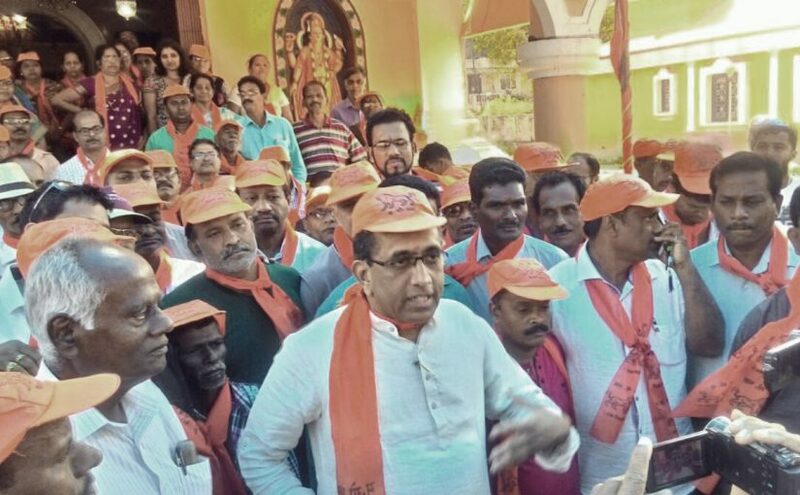 It has been proved repeatedly that no party in Goa can form the government without the support of minorities who still account for 30% of the votes and as much as 50% in Salcete and other constituencies like Calangute, Santa Cruz, Curchorem, and Aldona. It is possible that though the BJP have got temporary support of the BJP it may lose the six seats which are held by the minority BJP MLAs including the most loyal Michael Lobo. Lobo has made it clear that he expects to be included in the Cabinet or would quit the party. And a few stray thoughts on the Congress losing another opportunity to form the government. Following the death of Manohar Parrikar the BJP was again reduced to a minority. The BJP which had 14 seats including that of Vishwajit came down to 12 because of the death of Francis and Parrikar. As it is the Congress had 15 seats including the one seat held by Churchill Alemao of NCP. There were sudden rumours that Digambar Kamat would join the BJP and would be made the chief minister. The speculation was triggered by his sudden trip to New Delhi after the death of Manohar Parrikar. We understand that Digambar tried to persuade Rahul Gandhi that they could form the government with the help of Vijai Sardesai and three Independents if he was made the chief minister and Vijai the deputy. This was the same deal that was offered when after the election Vijai offered to support the Congress which had emerged as the largest single party with 17 seats. But Luizinho Faleiro publicly admitted that Digvijay Singh had not permitted them to stake a claim to form the government. In any case, Luizinho was not acceptable to Vijai Sardesai. Even while extending support to the BJP, which had got only 13 seats, Vijai had made it clear that his support was to Parrikar and not to the BJP. But once again with the high command not supportive of Digambar, Vijay rejoined the BJP with a promotion as deputy chief minister. The post of deputy chief minister by itself does not have any meaning. What matters is what portfolios are given to Dhavalikar and Vijai. We only hope that Pramod Sawant keeps the home and finance portfolios with himself. If he gives the home portfolios to Dhavalikar it would be like handling over the government to the Sanatan. Vijai cannot also be trusted with the home minister’s job as he will use the police as his personal hit men. It may be recalled that during a controversial meeting of the TCP he had hired bouncers to keep out people protesting against the amendment to the TCP Act. And a few stray thoughts on why Prime Minister Narendra Modi did not attend the cremation of the late chief minister Manohar Parrikar. Modi owed a great deal to Manohar Parrikar. Way back in 2002 when Modi was about to be sacked as Chief Minister of Gujarat by then Prime Minister Atal Bihari Vajpayee, it was Parrikar who had saved him. Again in 2014 it was Parrikar who pushed aside senior leaders like Advani and Sushma Swaraj and suggested that Modi should be made chief spokesperson of the BJP for the Lok Sabha elections at the executive session held in Goa. Subsequently, it was Parrikar who insisted that Modi should be projected as prime ministerial candidate in the Lok Sabha. They fell out when Parrikar was ignored by Modi when he concluded the Rafale deal with then French President Hollande on the condition that Anil Ambani should get the contract for the maintenance and future manufacture of Rafale aircraft worth `35,000 crore. This has not been denied by Modi and Parrikar during his illness has not commented. There have been reports that Parrikar was responsible for leaking the dissenting note by senior Defence officials against the direct deal between Modi and the French president. The note was definitely used to keep Sudin Dhavalikar out and ensure that Pramod Sawant became the chief minister. Despite this, the actual reason for Modi’s absence was out of security concerns, not any implied disrespect. People from all walks of life came to Kala Academy to bid Parrikar goodbye. Among them were all the top industrialists in Goa. Contrary to reports in the press Shrinivas Dempo and Shivanand Salgaocar were not the only industrialists present. While they went into the Kala Academy through the VIP entrance, Nana Bandekar in his typical humble fashion stood sweating in the hot sun with the aam aadmi to pay homage to the late Manohar Parrikar. Perhaps this is part of Nana babs philosophy that in death everyone is equal. It was very clear that Sushant Nadkarni who was the last to meet Manohar Parrikar when he was alive has now been accepted as part of the family by the children of Parrikar, Utpal and Abhijat. They seem to have accepted him as substitute godfather which is not surprising considering Sushant was the only personal friend that Parrikar really had. To the extent that when Parrikar moved to Delhi he made sure that Sushant was appointed additional solicitor general of the government of India. There is every chance that he may succeed 86-year-old KK Venugopal as the attorney general of India. Not evident or prominent were old friends of Parrikar like Dr Shekar Salkar who treated Parrikar’s wife Meghna, a Bombay girl, who also died of cancer. In Meghna’s case it was deadly blood cancer. Parrikar’s cancer could be partly attributed to excessive use of tobacco. He started smoking 40 to 50 cigarettes a day. Subsequently he switched to chewing tobacco which is worse for the pancreas. Pancreatic cancer is very common in Goa as the majority of the population eat only non-veg food. Although the Hindu community does not eat pork or beef unlike the Christians, they do eat a lot of fish which may have been contaminated with formalin. Parrikar’s favourite was fish tandoori. Parrikar also had a weakness for black tea and would drink 20 to 30 cups a day. Parrikar was very particular about the black tea and it was kept ready for him at every function he attended. He would brief the chef himself on how it should not be too strong or too light, but the exact strength that he wanted. Though he avoided milk he was very fond of sweets and diabetes may have complicated the pancreas problem. As someone close to the Parrikar family shared, the final cause of death was the infected food tube which was changed only on Wednesday. And a last stray thought on why repeated attempts at lighting the funeral pyre of the late Manohar Parrikar did not succeed. Watching it on Prudent Media one could see very clearly that despite repeated igniting of the wood it would not catch fire. This was not because of any evil eye. Apparently the organisers of the historical event had forgotten that flesh and bone cannot be put to flame only with ghee and camphor. Nobody was willing to point out that even as tall a leader as Manohar Parrikar had to be doused with petrol or kerosene to make the body burn. It was only after somebody bought some cans of petrol that finally the pyre got ignited and the flames grew into the sky against the setting sun. Previous post: IT’S INCLUSIVE GOVERNMENT FOR GOA!